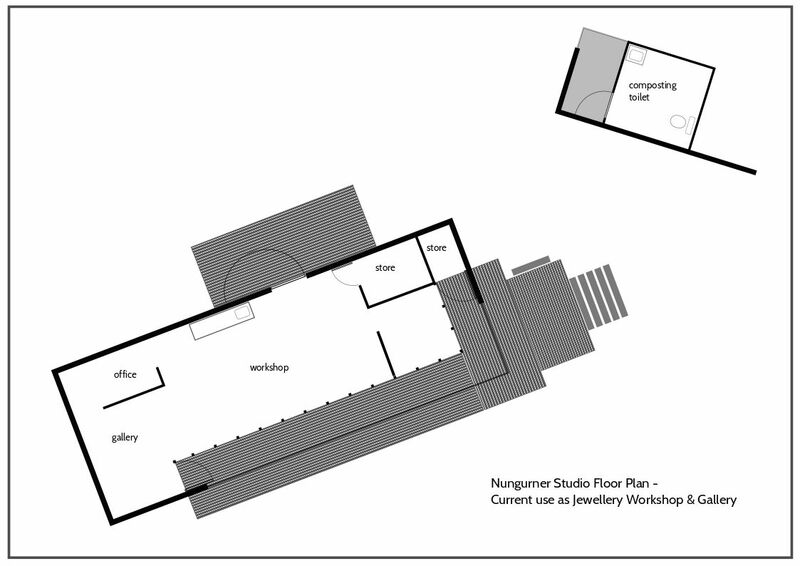 The open plan space currently works wonderfully as an artist’s studio but could easily be extended to be a stunning rural retreat or home. 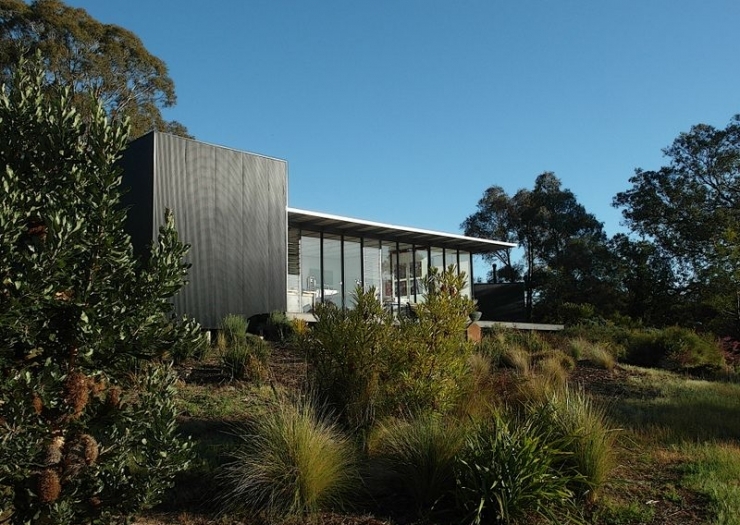 This unique and well-known commercial studio designed by architect Rick Bzowy features two exterior walls of floor to ceiling glass windows, framed in galvanised steel for a very contemporary take on the humble rural tin shed. – reclaimed timber floor (mountain ash), coloured via a process of vinegar and steel wool and sealed with Tung oil. – lovely morning light, the studio/gallery faces south-east letting in the early sun through the expansive floor to ceiling glass wall. 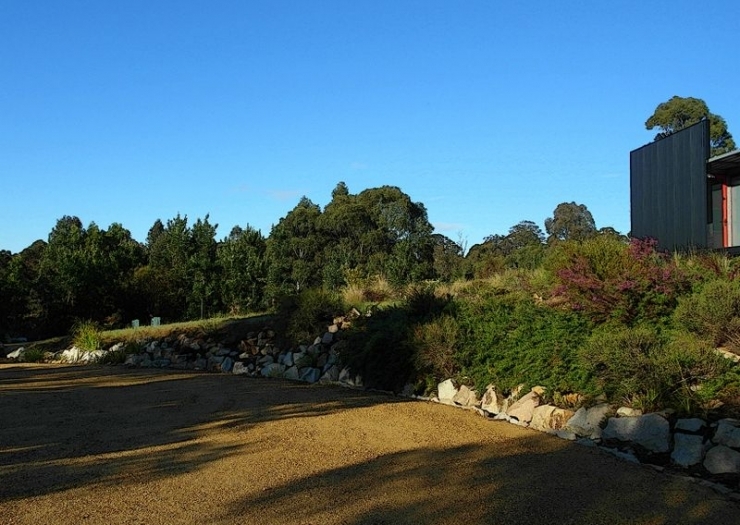 – Rock landscaping forms a native plant filled batter and water gutter on the carpark verge. 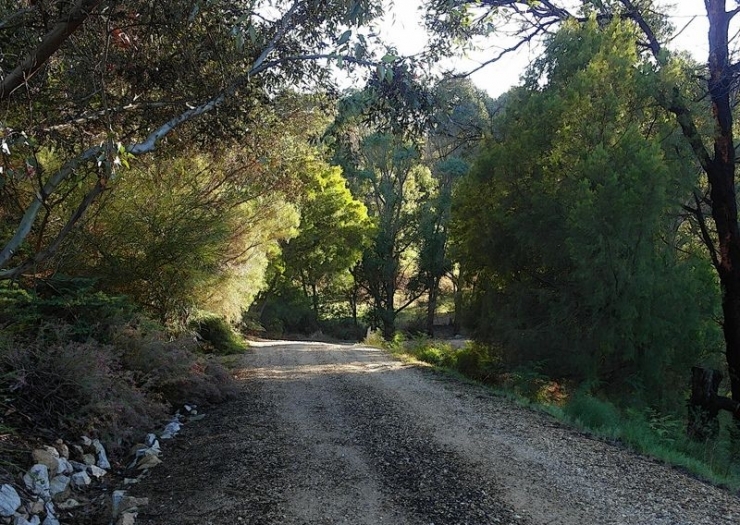 – Crushed rock path between native plantings leading from the car parking area to the timber steps and deck. – View from near the steps on the deck landing, you can’t see any houses from here! It seems like all of Nungurner, down to the lake is yours! – Looking south-west from the carpark. The car park and studio are situated near the top of a hill, and therefore the sky is quite expansive, great for stargazing at night! 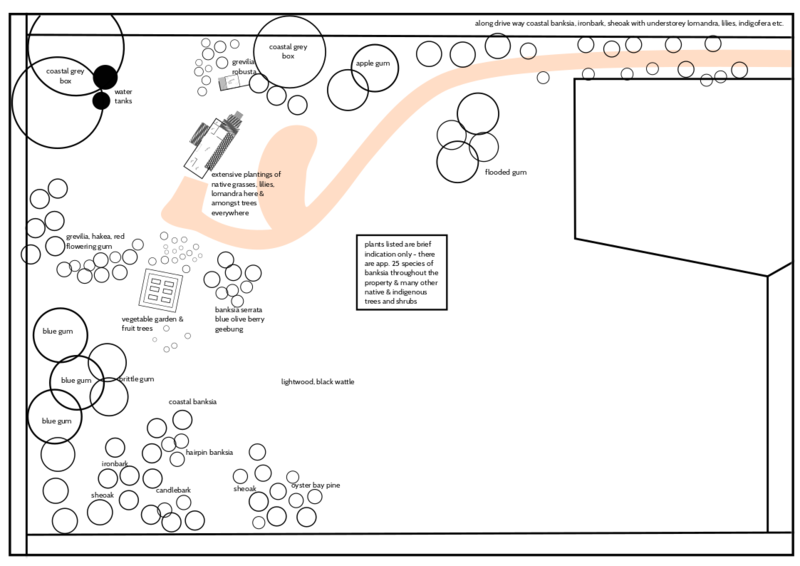 – The ‘saddle’ area below the studio. This is a wonderful site for another building (house), the trees (ironbark, various banksias, she-oak, spotted gum) offering protection from the western sun and occasional wind. -Looking south-east from the driveway and down into the gully and across to the other side. Native lightwoods in the foreground, blue gums in the distance. Clad in black mini orb and featuring an insulated timber floor, there is a separate composting toilet in the same style as the main studio. 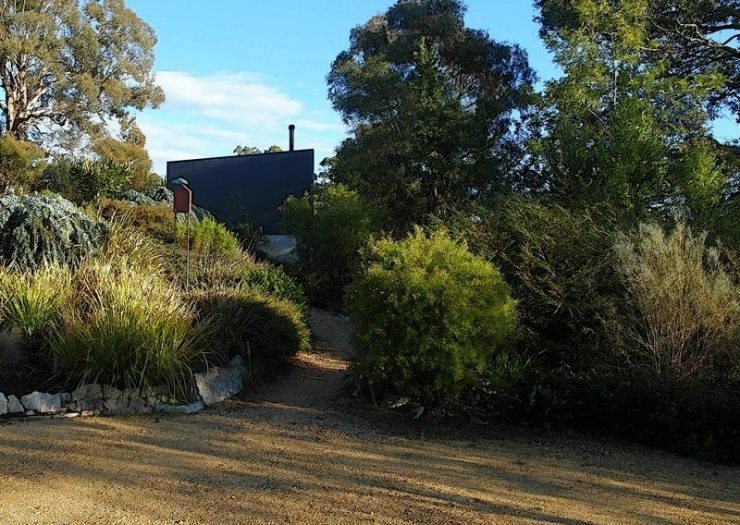 Extensive native plantings have been established together with vegetable gardens and numerous fruit trees that can be watered with the pumped taps around the property, serviced from the 50,000 litres of rain water tanks. The studio is situated in a way that provides an expansive view over the tops of trees from inside and on the deck. The property of 2.18 hectares (5.39 acres) seems to be 10 times larger as the surrounding land falls away to the nearby Nungurner jetty on the lakes. From here, just moments away you can swim or fish, sail or motorboat to the Ninety Mile beach, visit picturesque Metung and Paynesville or even go offshore for catching the big ones. 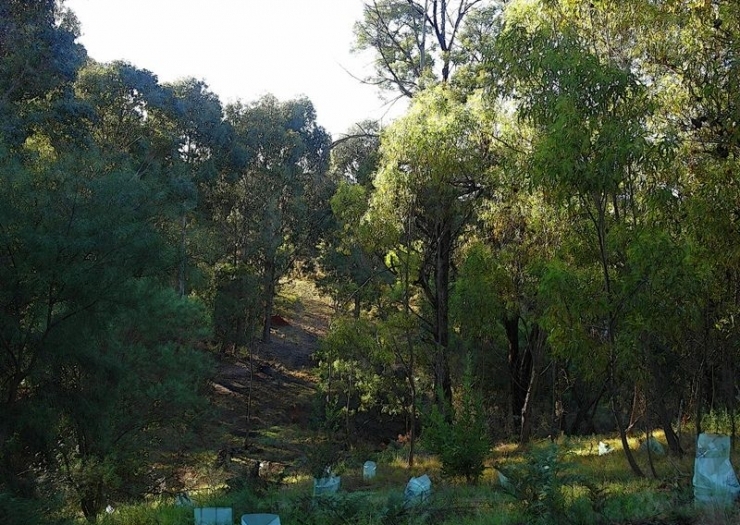 The mostly indigenous native gardens with many local banksias and ground plants providing habitat for the numerous species of birds locally as well as very friendly echidnas and a few wombats. 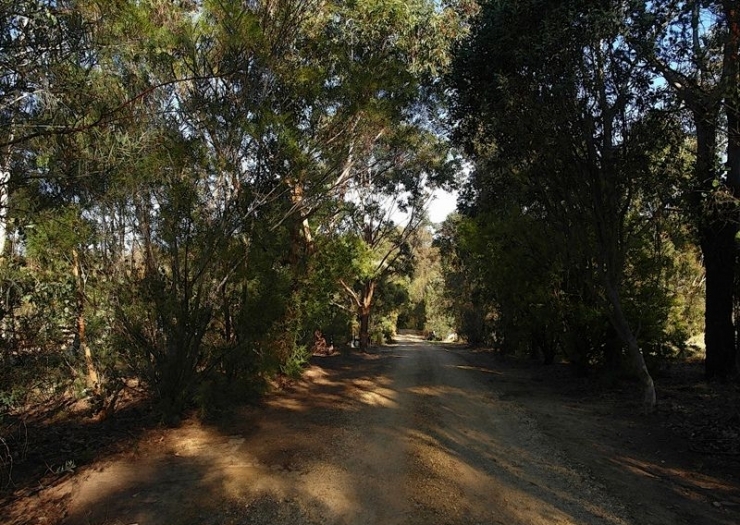 Near the entrance to the property and looking west down the long gravel driveway. Lots of revegetation work here, candle-barks and lomandra in the foreground. Along the drive ironbark, southern mahogany, banksia and she-oak predominate now instead of kikuyu and other introduced grassy weeds. 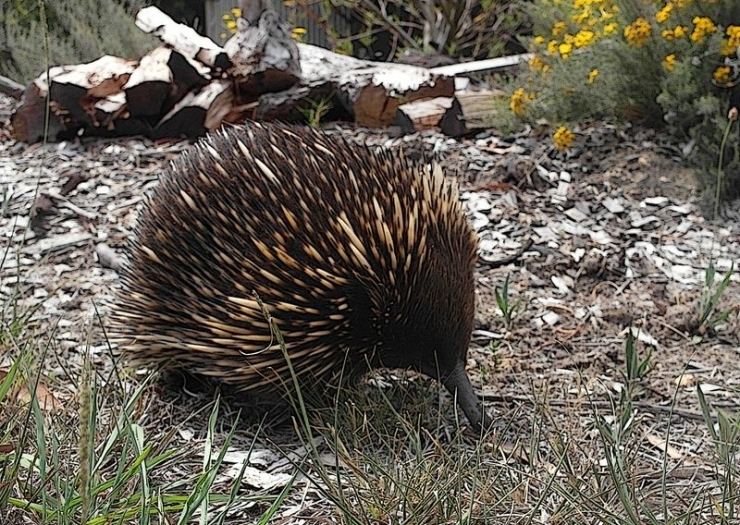 The numerous echidnas that call Nungurner home are often seen nose to the ground licking up ants around the studio. For services there is fixed wireless internet as well as phone line and underground power connected to the grid. The very low-key and beautiful lakeside sandy beach known as Nungurner Jetty. 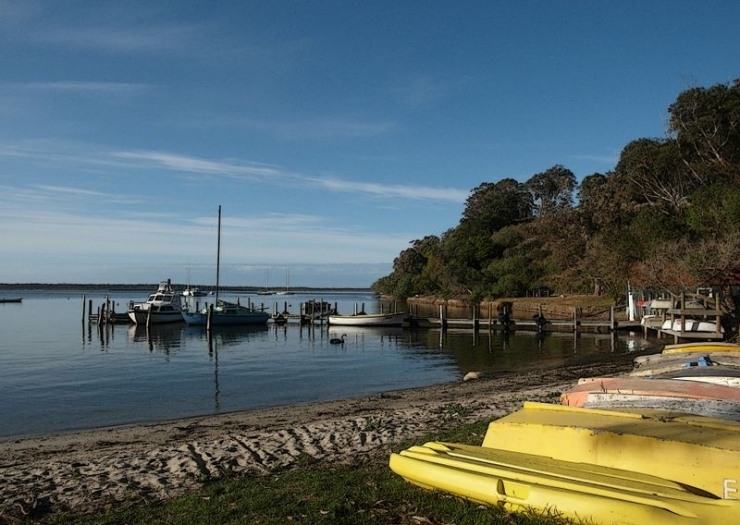 Here you can swim, fish, launch your tinny, kayak or larger motor boat to access other beautiful places such as Barrier Landing (and the ocean beach! ); The Entrance, to go off-shore; townships of Metung, Lakes Entrance, Paynesville amongst others. Of course, you can just pull up a beach chair and read a book or have a beer! 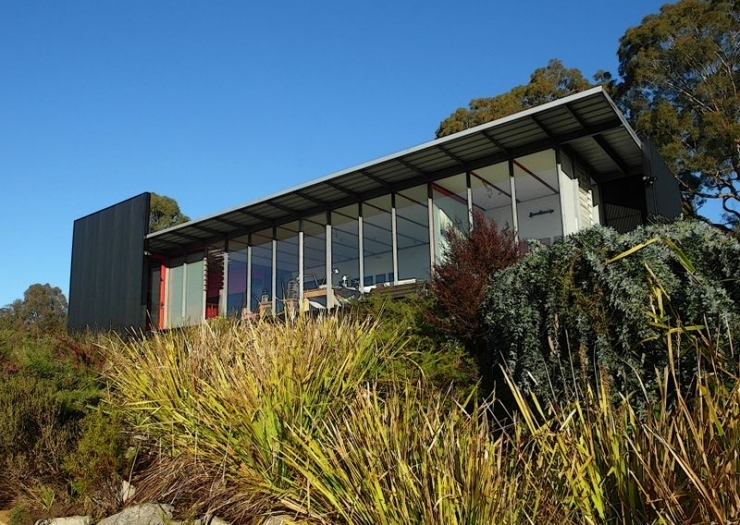 Nungurner itself is a beautiful and quiet locality of 50 or so residences nestled into slopes on the Gippsland Lakes. 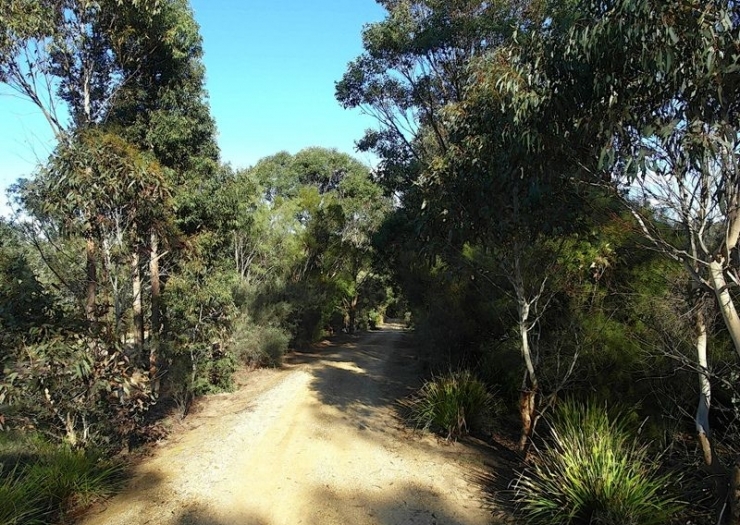 There is a wonderful small primary school and there are no shops but Lakes Entrance is only 15 minutes away and Bairnsdale 25 minutes. Melbourne is about 3.5 hours. 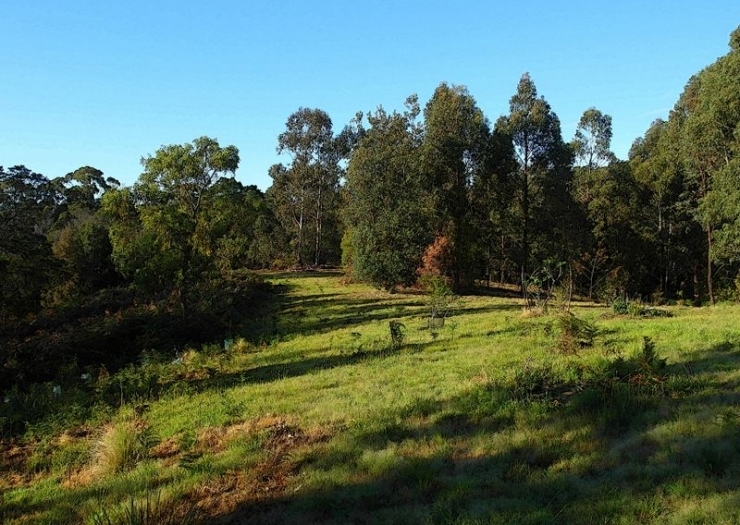 The undulating land divided by a gully provides the opportunity for subdivision or separate and future cottages/B&B development on north facing slope contingent to approval of course. Would ideally suit Artist/Architect/Creatives for studio/retail or a private residence for those looking for a nature packed coastal retreat.